Additionally, the first floor of the thing is almost completely without portals. The Shrine just has one open door and the second floor is high enough up that you could damn near hide a Defiler in it. That’s pretty good, especially for this edition where line-of-sight blocking terrain is so important. 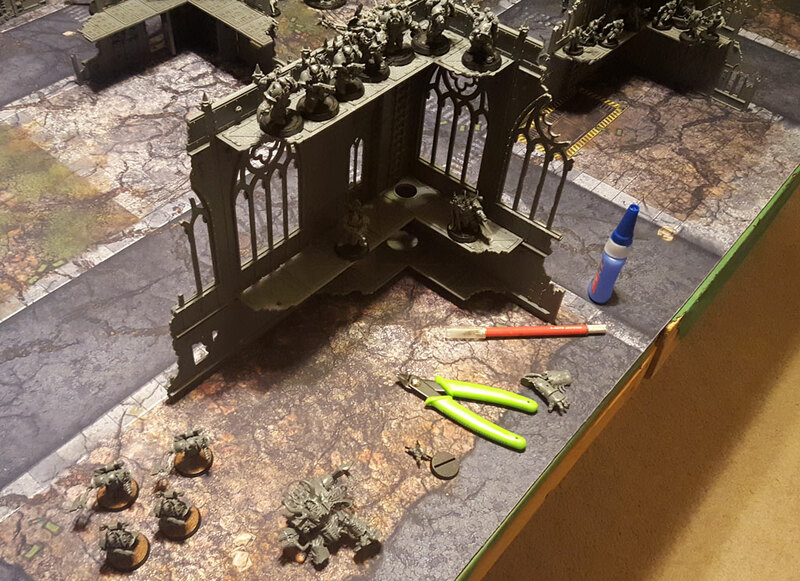 The Shrine is also taller than the other Sector Imperialis buildings – save the Basilica Administratum. The high perch is a good place for snipers or other ranged heavy-hitter infantry. The one thing I don’t like about it is the panels don’t fit together without leaving a gap. Mind you, the gap is pretty small, tiny even. Not enough to even draw line of sight to something. But it is annoying, even after repeated filing that the panels leave a gap. I’ll probably green stuff it before I prime it. I also built up the Chosen and Chaos Cultists I still had in my Dark Vengeance box. I even started on the Helbrute. The Chosen I’ve been wanting to do for a while. I’ve used a couple models from that group as Aspiring Champions for my Chaos Space Marines squads, and I’ve been wanting to have more load out options available. The only problem with the Chosen models is that this edition they aren’t WYSIWYG for Champions. They all have extra armament that would technically make them illegal. However, I haven’t found anyone who’s a big stickler for that this edition, so I don’t foresee any problems using them as I like. The models themselves really are excellent and I hope the next time the Chaos Space Marine line is redone they take the Chosen as a sort of template. 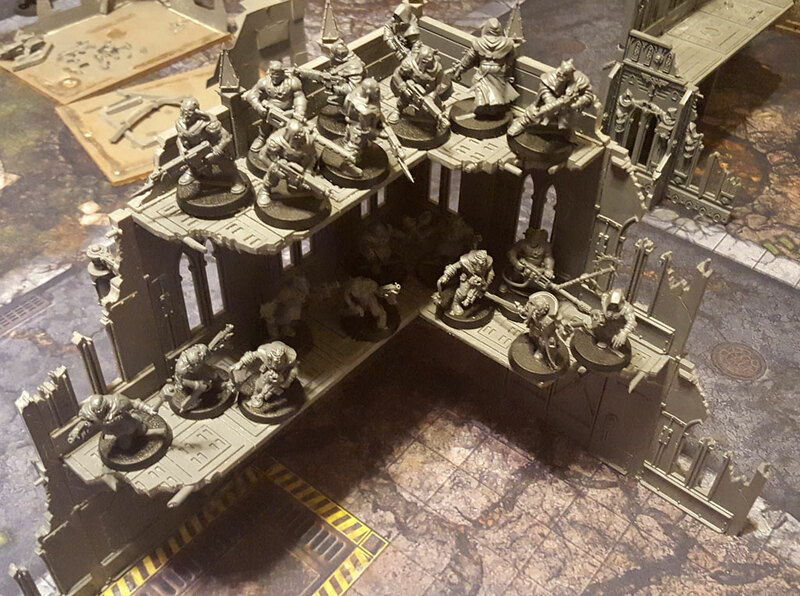 I’ve used the Chaos Cultists in a few games over the past couple editions. Sometimes they work how I want and sometimes they just stink. I’ve been thinking about how I want to work them in, or at least have them in an alternate list to my main Chaos Space Marines list. I do have a bunch of them now – 20 with Autoguns and 20 with Autopistols and close combat weapons. I hate just using them as meat shields or objective holders, but I guess that’s pretty much what they are designed for. I’ll have to think about some tactics where they might be more useful. I snapped this pic yesterday, so these two are actually a little further along than this. 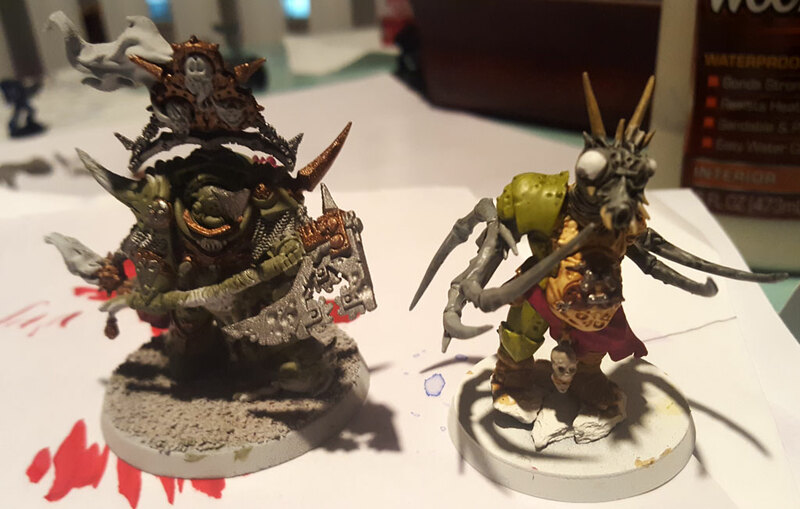 But I’ve been doing the Lord of Contagion in the scheme used by Duncan Rhodes. That saves a lot of “thinking” time when it comes to the scheme. I’m more or less painting by numbers for this one. With the Nurgle Chaos Spawn I tried an experiment with Seraphim Sepia over the white primer for the exposed fleshy parts, and it came out in a shade that was close to Kislev Flesh! It was a surprising result, but I’ll take it. Anyway, just a few more hours to go in the event and I need to get these models done. I’ll post up when I’ve got the final pictures. ← Second squad of Plague Marines is completed!